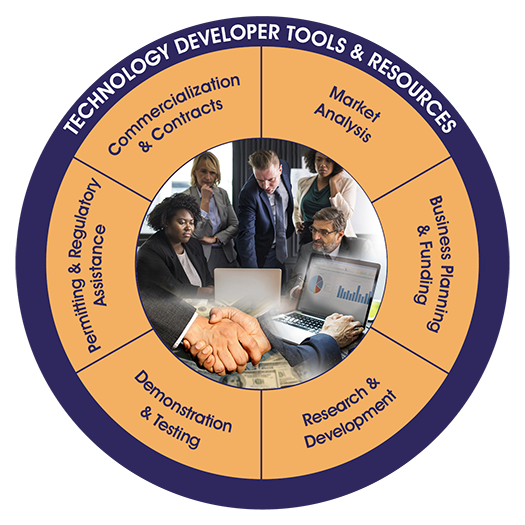 The Technology Developer Tools and Resources support area provides technology developers and vendors with tools to help advance technologies through all stages of product development from conception of an idea to bench scale and to full commercialization. The materials cover a broad range of topics that include business planning, marketing, financing, and technical issues and sources. The topics are organized into six sections arranged, approximately, in the order in which they are often encountered when developing and commercializing a technology. Each section addresses a particular group of activities that lead to the advancement of a technology from the germination of an idea to research, development, testing, and finally to commercial application. The sections are listed below. Users are free to access any one or more of the sections in any order as needed.